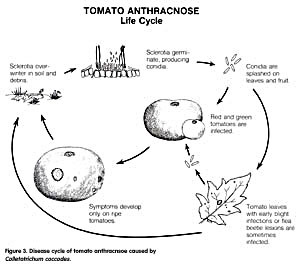 Tomato anthracnose is a serious disease of processing tomatoes caused by the fungus Colletotrichum coccodes and is a threat to tomatoes grown in New York State. To minimize the mold count in processed tomato products, processors impose a strict limit on the amount of anthracnose acceptable on the raw product. The most recently published United States Standards for Grades of Tomatoes for Processing exemplifies the low tolerance level for anthracnose: a tomato is classified as a cull when it has more than two anthracnose lesions or lesion(s) aggregating more than a circle three-eighths inch in diameter. Early symptoms appear on ripe fruit as small, slightly sunken, watersoaked circular spots (fig. 1). The lesions increase in size, become more depressed, and the central portion darkens (fig. 2). The darkened area contains many small, dark, fungal structures from which masses of salmon-colored spores are released in moist weather. As the fungus spreads within the fruit, a semisoft decay occurs. Anthracnose lesions on a single fruit often merge and result in large rotted areas. In addition, secondary organisms often move into these lesions and rot the fruit completely. The fungus can infect both green and red fruit and is able to penetrate the cuticle of uninjured fruit. When green fruit is infected, it does not show spotting until it begins to ripen. Tomato fruit become increasingly susceptible as they approach maturity. On ripe fruit, lesions become visible within 5 to 6 days after infection. The fungus survives the winter as seedlike structures called sclerotia and as threadlike strands called hyphae in infested tomato debris. In late spring the lower leaves and fruit may become infected by germinating sclerotia and spores in the soil debris. Infections of the lower leaves of tomato plants are important sources of spores for secondary infections throughout the growing season. Senescent leaves with early blight infections and leaves with flea beetle injury are especially important spore sources because the fungus can colonize and produce new spores in these wounded areas. Growth of C. coccodes is most rapid at 80° F, although the fungus can cause infections over a wide range of temperatures (55°-95° F). Wet weather promotes disease development, and splashing water in the form of rain or overhead irrigation favors the spread of the disease (fig. 3). Because anthracnose is more prevalent on poorly drained soils, tomatoes should be planted on well-drained land. Three- to four -year crop rotations, which exclude crops in the Solanaceae family, are recommended to prevent a buildup of the fungus in soil. Several fungicides are registered for use on tomatoes to control anthracnose. Fungicide applications should begin when fruit are formed on the first cluster. Refer to the current Cornell Recommendations for Commercial Vegetable Production for an updated list of available fungicides and their proper use.